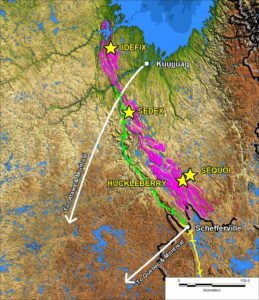 Labrador Trough, Québec – NorthernShield Resources INC. The Labrador Trough covers over 10,000 square kilometres of mafic intrusive rocks currently mapped as a unit called the Montaignais Sills. This makes the Labrador Trough an ideal target area for large scale Cu-Ni-PGE deposits. Why? Because in order to form PGE or Cu-Ni-PGE deposits, these metals have to be first scavenged from mafic/ultramafic magma. The more magma there is, the more metals there are to be scavenged and concentrated into massive sulphides. The areal extent of the mafic-ultramafic magmatic systems poses obvious exploration challenges and the region has seen little systematic exploration despite the numerous Ni-Cu-PGE occurrences. In order to effectively explore such a large region, Northern set about to find a method that would discriminate the various intrusive phases and indicate which rocks were prospective for nickel-copper-PGEs and which were not. Based on geochemical analysis of over 3,000 rock samples collected from the Montagnais Sills, the Company has identified at least two importantly distinct phases of gabbroic intrusions in the Labrador Trough: Idefix-type cumulate PGE bearing gabbros and regional non-cumulate (hypabyssal gabbros). While there are sporadic and very small nickel-copper-PGE showings in the Regional Gabbro, there is no known mineable deposit in the world hosted in such rocks and hence should not be targeted for exploration. 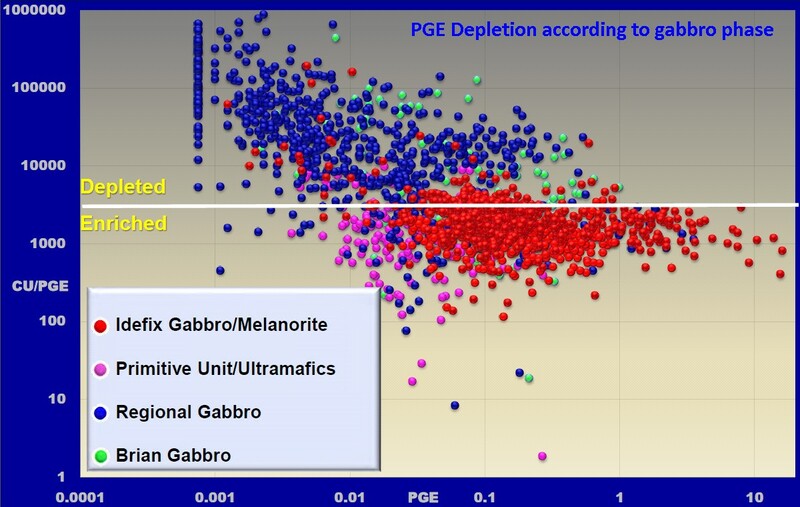 Additionally, when analyzing PGE depletion or enrichment in the mafic intrusive rocks of the Labrador Trough, the Idefix-type gabbros are nearly always seen to be PGE enriched versus the depleted regional gabbros. This confirms that the Idefix-type gabbro should be the focus of exploration and not the regional gabbro. However the presence of widespread nickel and PGE depletion in the regional gabbro is still an important indication, as to form a PGE deposit, it is a prerequisite that the PGE particles be stripped out (depleted) from one magma in order to be concentrated in another. Both Idefix and Noril’sk have large volumes of depleted mafic rock (basalts at Noril’sk and hypabyssal gabbro+basalts in the Labrador Trough) and small volumes of cumulate bodies. These analytical results are critical for guiding focused and successful exploration programs. The geochemical vectoring techniques have allowed Northern Shield to more clearly understand the mineralized potential of the Labrador Trough and where best to focus exploration for large PGE targets.